The Canon VIXIA HF R10 features an exclusive 2.39-megapixel HD CMOS image sensor fully designed and manufactured by Canon to capture High Definition video at 1920 x 1080 and 1440 x 1080 in AVCHD MTS format. The CMOS delivers high color resolution and advanced color reproduction for brilliant results. It supports to record up to 3 hours of crisp high definition video to an 8GB internal flash drive or directly to removable SD memory cards. With such recorded large MTS files, you are hard to log and transfer them to your FCP for fluent editing. 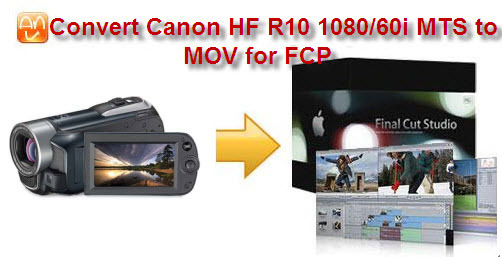 So if you want to have a fastest and best editing of Canon HF R10 1080/60i @24mbps or 1440*1080/60i 12mbps MPEG-4 MTS files with FCP on Intel or PowerPC Mac, I suggest you to convert Canon HF R10 MTS to MOV with smaller size and still retain with 1080i 24 mbps or 1440*1080/60i 12mbps. How to convert Canon HF R10 1080/60i or 1440*1080/60i movies to Final Cut? First, we shall transfer the .mts files from Canon VIXIA HF R10 AVCHD camcorder to computer hard drive. Download Aunsoft MTS/M2TS Converter for Mac as the MTS to Final Cut converter. Step 1. 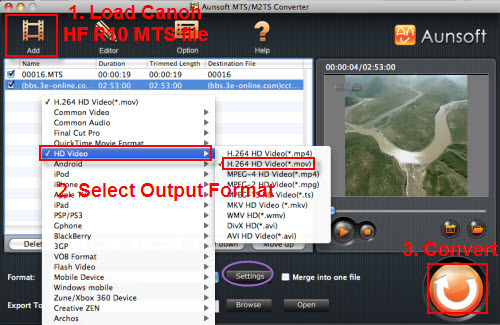 Load Canon HF R10 MTS videos to Aunsoft MTS/M2TS Converter for Mac. Transfer Canon HF R10 AVCHD videos to computer hard drive via USB cable. Run Aunsoft MTS/M2TS Converter for Mac as the best Mac Canon HF R10 MTS converter, and click the “Add” button to load .mts videos. Click the “Format” option, and choose HD Video > H.264 HD Video (*.mov), and the default video codec is H.264. H.264 is now a codec with the best compression for shrinking your large MTS files and still keeps the original video quality. The default settings of H.264 HD MOV is: video resolution: 1920*1080, frame rate: 30fbps, bitrate: medium quality (you can customize it to 24000kbps). If your recorded videos are 1440*1080/60i 12mbps files and wanna keep these settings, you can click “Settings” button to adjust the video resolution to 1440*1080, bitrate to 12000kbps. Step 3. Convert Canon HF R10 AVCHD MTS to MOV for FCP 5/FCP6/FCP7. Click the convert button under the preview window, the MTS to MOV converter will transcode Canon HF R10 1080 or 1440*1080/60i MTS to HD MOV for editing in Final Cut Pro. The converter will deinterlace and remove interlacing artifacts by default. Well, all can be done with just 3 simple steps to make Canon HF R10 AVCHD videos compatible to non-linear editing software.